Duke Ukem play an eclectic variety of music styles from the heavier guitar bands to mellow soul sounds. They explore the versatility of the ukulele by playing more of a guitar style than the common vamps of the ukulele. 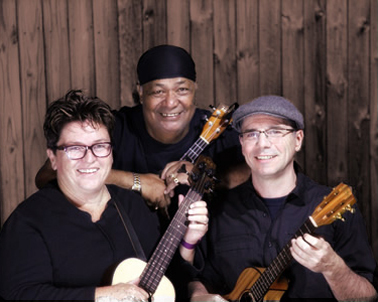 All three performers, Mick Angeles, Marg Monaghan and Mike Heaton, are talented ukeists and vocalists that can also incorporate guitar, banjo, mandolin, keyboards and electronic effects. Between them, they’ve over 40 years experience in the music industry. Duke Ukem would like to impart to their audiences that the uke is more than a bad Xmas present for kids. It’s a versatile instrument capable of playing some magical pieces of music that wouldn’t be normally thought of as ukulele-based, like songs from the guitar bands of the 70’s through to today’s music. Duke Ukem — ‘ukem keepem rockin’!